Club Penguin Cheats by Mimo777 Club Penguin Cheats by Mimo777: Mimo's World Famous Rockhopper Comment Tracker! LIVE! Mimo's World Famous Rockhopper Comment Tracker! LIVE! Found him on frozen, cove and ice burg. Heres a little helpful hint for all you ppl! Rockhopper starts at top and gos down. His fav servers are Mammoth and Frozen. His favorite shore rooms are light house, dock, his entire ship, and cove. His fav land places are town, snow forts, pizza parlor, and ice burg. Hope this helps! Rockhopper is almost never on completely crowded servers. Try checking servers with three or four bars. Penganor 123 said Lats time I saw him was at 6:47pm on mammoth. (thats in English time). Rockhopper NEVER Goes to the Dojo, Mountain Top, Ski Lodge, Gift Shop, Nightclub, Pizza Parlor, Coffee Shop, Beacon, Lighthouse Or Ski Village. If Anyone Posts These Loctation's You Cannot Trust There Comment. Rockhopper's Most Used Area's Are The: Cove, Circus Entrance Beach, Ship, Ship Quarters, Captain's Quarters And The Circus Tent. Ship Hold, Crow's Nest Or Ship. if u hav one of rockhoppers old backgrounds then can u still get his new one?? Iceburg on iceburg!!! But its full grr! i cant find him help me mimo plez!? Lol I just met rh on some French server! Here's a tip- French rockhopper is AWESOME! He was all like bonjour and Stuff! It rocked! But i didn't now wat he was saying until I told him I don't speak French! And then he said ahoy fatfeet! It was cool! Then he said somthing in fluent french. remeber he is on crowed servers in the days and on less crowed servers at night and mornin when not to many people are on. Is RH always on one of the other language servers. As in, does he go from, say french servers, to other french servers as well. As in, are there regualarly 4 RHs on the different servers for different languages. 1 for English, 1 for Spanish, 1 for French, and 1 for Portugese?? 1:24 CP time Northern Lights Town!!!! Rockhopper's on Texedo, and he's at the cove. Now Rockhopper's at the server Iceberg, at the Iceberg. right now im on the ship in YETI! its full hopefully he will come! thanks for putting up the tracker again! ALTITUDE ICEBERG GO GO GO! BIG SNOW MOVING LIKE CRAZY!! ITS 8:45 AM PENGUIN TIME!! he just left flippers sorry but i met him!!!!! whooooo!!!!! rockhopper telling a story on rocky road cove right now go! I met him. (well I think I did) What hapend was... I went to abdominable crows nest and I think he was there. Then I got the stamp and a message came up. It said: This server has automatticaly banned you for saying 'Hacking rockhopper stamp'. I didn't hack! Then I sent a e-mail to cp and in around an hour I was unbanned AND they added 3000 coins, the new rockhopper background AND the rockhopper stamp. They are so kind. I love cp. Come on guys lets help ALL the ppl that havent found rockhopper yet. Well guys... Keep tracking before Rockhopper leaves the island! ROCKHOPPER IS AT COVE ON WINTERLAND NOT LyING! Not many people are posting. Either that or Mimo is taking a break. I must find Rockhopper! Also, if you find him, tell me if he has any stamps. That's one of the reasons I wanna find him. To see if he has his own stamp! LOL! dang rock hopper JUST left wool socks! i saw him but then he said fair winds and left before i clicked on him grr!! HE'S ON BOBSLED! No, I haven't met him, but I found a tracker that is updated maunally like Mimo's pin finder. COVE! BOBSLED! OMG Dude that is so cool! They added three thousand coins to your account?! Lucky! I wish I could meet rockhopper before he goes. I only met him last year when I first joined but I did't have a clue who he was back then and I have a really out of date background and I want the new one! MATTERHORN=SERVER COVE=ROOM GO GO GO! club penguin messed up my account!!!! :( it won't let me delete any of my old mail. it always won't let me buy an igloo when i'm a member!!! i bought the split level in blue and it took away my 4,00 something coins but it didnt give me the igloo. i bought the split level igloo in pink. took away my coins and still didnt give me my iggy. i'm stuck with my old fishboqwl house :( and i sent an email... but they wont do nothing!!! i wish i could find him! I first joined cp last year around christmas and my friend got me his backround and i have yet to meet a famous penguin myself!and ive been on for a whole year! keep posting mimo! he is not in north pole i cant find him who saw him now? PATAGONIA SNOW FORTS! FROM MAX JR9! Come on ppl we need to help find rockhopper forppl that havent found him!! SNOW BOARD AT THE COVE NOW HURRY!!!!! Give them a chance to respond they ALWAYS help! can someone please tell me where Rockhopper is? i've been waiting four years to find him! guyz i have an idea. go to 5 starts server or 4 starts server ok.
hes at ice shelf at the cove! guyz maybe he is in server mamoth. in his ship. all penugin s are there and full . 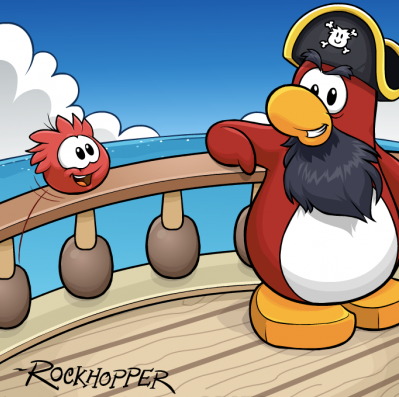 TIP: get into servers expected to have rockhopper before their full. Thank you mimo! I found Rockhopper for the first time! Thank you so much! rockhopper is in sub zero right now in the puffle circus right now!!!!!! never mind he logged off of sub zero! I think we should start a search party... anyone up for it??? Meet me on Beanie at the cove if so. does anyone know the average rockhopper places times, if there are any real ones? i always see things like that but never know if they are true. Were is he now? I havent found any famous penguins ever! And ive been on for almost 2 years! Rockhopper is at the Night Club in the server "Yukon" hopefully its 2 dots open. beach of Kosciuszko were flooded of penguins...they exclaimed that rockhopper was is his quater...many of us cant get into the beach!!!! *SORRY THIS ROOM IS FULL!!!! and rockhopper said "what fine magic ths be!" Great searching yesterday everyone! To bad we didnt find him :( but theres always tomorrow! Anyone know where he is now?? Someone said he is in the coffee shop in Ascent. Im going to check once I send this! So Im not sure if its true..
were is he now anyone no? where is rock hopper now ??? has anyone seen Rockhopper recently? I need to meet rockhopper help me! Is Rockhopper online 24 hours a day? ROCKHOPPER's on breeze having PARADE!! !